Turned 24 yesterday and celebrated with inexpensive dinner and dessert at Chick-fil-A by the slightly mediocre movie The Bank Job at home. Dinner with the family tonight, Dave and Buster’s on Saturday for Kurtis, trip to Dana Point on Sunday, and then Vegas Monday through Wednesday for more mourning of the end of Kurtis’s bachelor status. I wasn’t planning on getting much in the way of birthday presents, but I’m getting myself something that I just couldn’t resist. Saw an older Rossi Model 62 .22 pump action rifle for sale on Calguns.net and the price was good. It’s a remake of the classic Winchester Model 62, but those cost 3-4 times as much. The seller was local so we’re meeting at Ammo Bros tomorrow morning. Should be fun and cheap to shoot, more details to follow. Got some new pictures up in my image gallery: Turlock from earlier this year (The Blarg had high def video posted, I’ll stick to pics) and My Righteous Indignation’s graduation/hooding/party. Enjoy. And just a side note on the pics. I processed the heck out of the Turlock pics in Photoshop with a painfully manual workflow. The graduation pics were processed with the Adobe Lightroom beta and are pretty much straight from the camera except for a little cropping and white balance adjustment. I’m going to be using Lightroom some more and write up my impressions. The one thing I’m really liking is non-destructive edits; no more exporting to TIFF so I don’t have to worry about saving JPEGs more than once. If you don’t read The Blarg then you don’t know that I became an uncle this weekend. Head on over and check out some pics of my cute little nephew. How open should we be about our finances? In my post about finishing my taxes I referenced how much our refund was going to be. Sarah asked why I included the number with the implication that information about our finances is personal and should be held back from public discussion. Ever since I graduated from college and started moving towards financial independence, personal finance has become an interest of mine. Growing up I never really knew much about our family’s finances, sometimes money was tight, but we always lived within our means. That’s the number one thing I’ve learned about money and is the key to saving for the future and being financially secure. Personal finance is an important part of our lives, so why are we reluctant to talk openly about money? It might be that we still see money as a symbol of status. We might be ashamed of debts. We might not want to feel like we are bragging or putting ourselves above others. Whatever we feel though, it is most likely tied to emotions and as far as I can tell emotions and money don’t mix. In my life I have “unpersonalized” personal finance. But how open should we be? I’m not suggesting we announce our income and current portfolio value when meeting someone, but when talking to friends and family I’d be open to asking for and offering advice. Getting advice and working out finance problems is incredibly important considering the opposition we face in our consumer spending driven society. I think we should be open enough to discuss our tax situation and tactics we use to reduce our tax liability. We should be open to discussing how we are saving for retirement. We should be open to talking about problematic debt and helping each other eliminate it. What do you think, are finances open for discussion or private matters? This will be our first Christmas on our own and it has led to some interesting developments. I’m down for just sleeping in and having a nice relaxing morning. 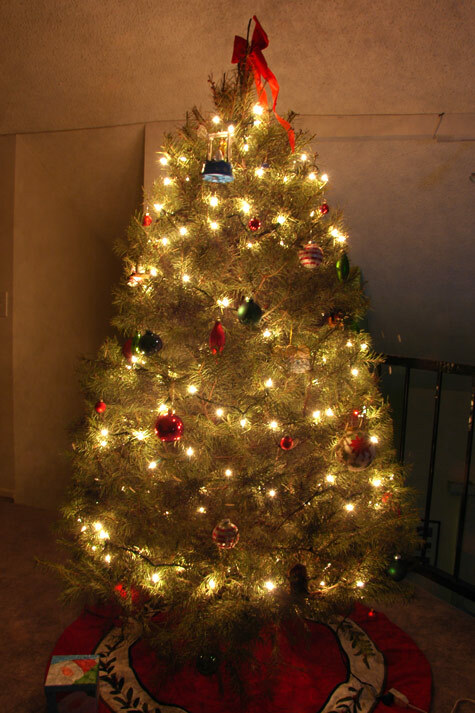 Anybody have stories about their first married Christmas or adjustments that had to be made in family traditions? And of course our first Christmas tree.